This post is sponsored by Olay. The text and opinions expressed are 100% mine. Thank you for reading and supporting my blog! “Mom” is a role that has forever changed me. The moment my baby was put in my arms, my world, priorities, and goals completely shifted. It’s humbling to be the person who helps mold and shape other humans. Moms are presented with unique challenges through the child-rearing years. Raising kids while cultivating your identity is not for the faint of heart. Those challenges multiply if you also work outside the home or run a business. I was inspired by this video from Olay about women pilots. I had no idea only 6% of pilots were women! I love the mission of this campaign to tell women they are fearless females despite societal norms. It inspired me to tell my story of being a working mom and the lessons I’ve learned along the way. These lessons have certainly helped me overcome the challenges I’ve faced along the way. 1. People will always have opinions on what mothers do. When I worked outside of the home full-time, I had so many negative comments about leaving my babies. I have lost count at the number of times someone has said something like, “Don’t you wish you were home?” or “How do you feel about your baby in daycare?” It was maddening. At a preschool parent-teacher conference I had to miss, my husband was told my kids “need their mommy.” That comment hurt me deeply for years. Of course, I missed my children (especially when they were babies), but I needed to work. It was essential for our family. While there were really hard times, it was worth doing. I have always wanted to be a working mom. Nowadays I work from home and people think that I’m a stay-at-home mom. Or that I’m doing “better” being home with my kids. The thing is, I’m still working, just in an unconventional setting and from home. People will always have an opinion on what moms should do, but what you’re doing is best for your family. I have learned to let go. 2. Contributing financial support to my family fulfills me. Like I said above, I’ve always wanted to be a working mom. This is a very personal decision for each family, and what fulfills me may not fulfill you. I’ve always been driven and had an extremely strong work ethic. Within the last year, my hours and schedule are drastically different, and I’m no longer out of the house, but I’m still putting in full-time hours. Ultimately, contributing financial support to my family fulfills me. I have always loved to help and provide. I choose to contribute financially to our family’s future. 3. Working too hard can be both a bad or good thing. I’ve experienced both the bad and the good of working too hard. The bad times were when I was teaching and directing theatre full-time while also trying to be a mom to a newborn. I remember pumping behind costume racks during a late-night dress rehearsal and thinking this was too much and I needed a change of pace. On the flip side, I have worked extremely hard on my blog for many years with little reward. My blog has always been my passion project, and something has always drawn me to it. My husband (understandably so) didn’t get why I was putting so much work into something that did not financially reward me. Luckily for all of us, my years of working “too hard” paid off and this is my full-time job now. Don’t worry – Greg is an extremely supportive husband who encourages me to chase my dreams. He is now my blog’s number one fan and supporter. 4. Superiors have not seen past me being a mom, but I am more than that title. When I had young babies, it felt like some of my superiors could not see past me being a mom. It was always brought up in passing and in meetings. While I love to gush about my children, I felt it was not important at work. My performance as a teacher had nothing to do with it. I was even told by a principal, “I know you’re a torn mama. When I had young kids, I stayed home. I know this is hard.” The intent may be well-mannered, but being seen as a great addition to the teaching staff was more important to me in my job setting. I am more than “mom.” Saying that is not selfish. 5. My business is a serious business. I previously mentioned it’s sometimes hard to be taken seriously as a professional blogger. We do make it seem really easy, and I suppose I am doing my job correctly if that is how it all appears. It doesn’t matter if I was a mom or not, I run a full-fledged business. I have worked just as hard on my blog as I did at my 9-5. In addition to photography, writing, and managing my five social platforms, I spend a lot of time on marketing, negotiating, contracts, and being available for my audience. I love this job more than anything, but it is work! 6. I’ve taught my children the importance of independence. I think it’s particularly important these days to teach girls independence and how to be self-sufficient. That’s the biggest lesson I hope to teach my daughters. I want them to work for something they believe in and feel confident to do it without the support of anyone else. 7. Working outside and inside the home have different sets of challenges. I’ve learned that both working outside and inside the home both have challenges, although very different ones. 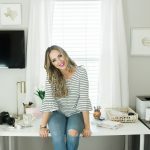 The obvious challenges of working outside of the home as a mom is finding good childcare, spending a lot of time away from my kids, and missing important events and milestones. When working in the home with kids, traditional office hours are not a part of my routine. The work gets done when it can get done, and it means I have a lot of late nights. It’s hard to shut off. 8. The milestones and moments I’ve missed do not define my impact as a mother. Like I mentioned, I’ve missed important milestones and moments working outside of the home. It used to eat me up inside. Mom guilt is a real thing. I have learned to let go and focus on the present. Missing those moments do not define how my children feel about me. Quality time with my children is more important than the quantity of time. 9. The stay-at-home vs. working mom battle will never be won, but we can change our mindsets. Why fight a battle that’s so deeply personal? Like I said before, people will always have their opinions on what a mother does or does not do. The decision to stay home or work is only made by you. As a culture, we should be accepting and encouraging to women who take on unconventional roles. This goes beyond the workplace. Let’s change our mindset and be an encouraging voice to women doing the best for their families. 10. I can do anything. I am a fearless female. Thank you to Olay for inspiring to tell my story!